2016 Update: Check out our latest discussion on summer blazers. I look for lightweight jackets with a bit of stretch and 3/4 sleeves are nice too. I refuse to wear linen because it looks like a mess after wearing for five minutes and it’s not that hot here in the PNW. But I’ll have to check into linen prints and/or stretch linen as that might ameliorate the wrinkling problem. 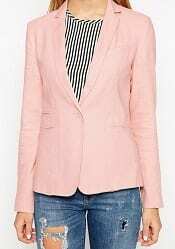 I’ve found that long blazers and ones with bulky pockets are extremely unflattering on me. Maybe I’m just more of a jacket person. 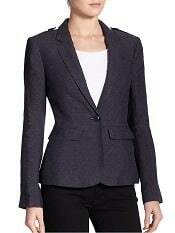 Saw this on Cap Hill Style today: Ann Taylor is having a 50% off sale if you use the code SECRET50. Went to the site and saw a 40% off code, but the 50 works. If you’re interested in #3, it’s a good deal. Kat: Is there any way that you could collect links for these posts without doing the series of description-less links? (e.g., “here, here, here”). I would love to see what you’ve rounded up, but I can’t just click through on all the links in the hopes it’s something I’ll like. Two of the “here” links in the under $100 line are the Anne Klein and the ASOS blazers mentioned in the body of the post. It seems unnecessary to list them both places. Yes. Could you post little thumbnail pictures instead? Perhaps similar to what you’ve done for Nordstrom roundup sales? 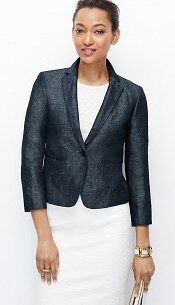 I found this great white blazer from Target the other day (http://www.target.com/p/women-s-ponte-blazer-merona/-/A-16645151) and I’m trying to decide whether to go for it or the Caslon one for a light summer blazer. I’m a law student and I’ll be summering with a public interest org, but I’m thinking of doing private practice next summer. Which do you think is more versatile for its budge-consciousness?